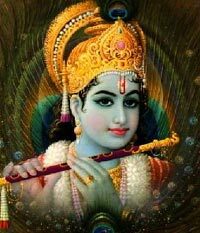 Lord Krishna is India’s peerless avatar. He took incarnation many years ago when India was facing internal strife. Through his devoted disciple Arjuna, Krishna gave the immortal message of the Bhagavad Gita on the battle fields of Kuruksetra. The Bhagavad Gita is a teaching of the highest divinity. Sri Krishna was an embodiment of divine love and is often the principle focus of the Hindu bhakti or devotional tradition.